Silverplated A.D. Coffee Spoon, 4-1/2"Whether your dinnerware is undecorated or traditional, this versatile dinner coffee spoon will be an asset to your dinner table. 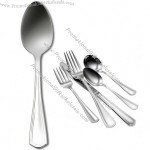 The versatile silverplated spoon will bring a timeless beauty as it serves you for years to come. Custom-made AD Spoon From China Factory, Low price AD Spoon, Top Quality, True wholesale source for original!